Definitely, one of the best things of my job is the great people I work with, and get to meet. 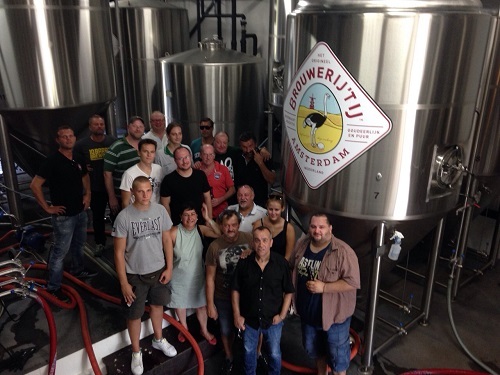 Whether they are colleagues at the office, brewers or brewery employees, international colleagues, bar owners, – staff or – customers – it’s an astonishing group of mostly very friendly and good-humored people. Some of them have grown to be dear friends: Phil in San Francisco, Marcus in Freising, Simon in Amsterdam, Janne in Helsinki, Andreas wherever he is – to name but a few. You get to live the strangest things with them. Enter Markus – from Vienna, and another 3,000 green-white clad football fans. Markus works for an Austrian beer importer and there’s a certain click. 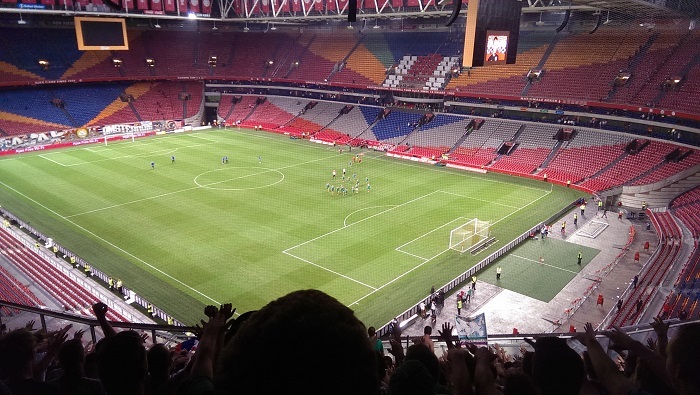 In fact, it clicks so well he managed to convince me to accompany him and his Rapid Wien fan club to see them play Ajax, my home team, in my hometown stadium – but in their section of the stadium. First time I ever saw a game from K-stand, where – if I ever go to Ajax, which is rarely because the beer offering is rather poor – I’d normally give a finger to. I couldn’t wear Ajax colors lest I’d be taken apart by 3,000 Wieners (yes, yes….) so I wore black, which seemed fitting. What did I know: Ajax lost 2-3 and the Wieners get to play Man U in the final Champions League Qualifier. Forget it: the day itself, and the day before, were great! Real fans arrive a day early and so did Markus and his mates. They needed some entertainment so we toured brewery ‘t IJ: both Patrick and Bart showed them around and fed them all things IJ, after which we hit the IJ tasting room and then In de Wildeman, my club house. We lost each other on the way to a Thai snack bar. 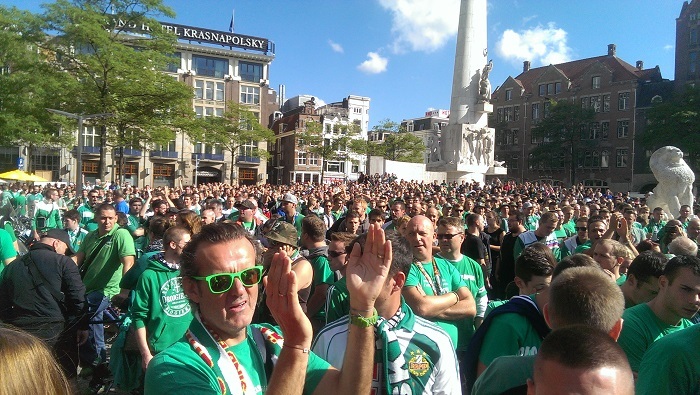 Never mind: next day Dam Square was filled with green-white Wieners drinking steadily, prepping themselves. It turned out to be a memorable experience. Around five the group gathered, police all around. A guy snapped his fingers and all hands went up. He snapped again and a roaring singing began, a song about them being crazy Wieners who kick their wives out onto the street to get some money in for them to spend on beer and football, or so I believe. From here on it was total mayhem. The singing continued until the police forced us into the metro to Amsterdam Arena. The metro was so hot no one even thought about singing, but when the doors opened and the Wieners had regrouped, their leader snapped his fingers and they roared again. During the searches whilst getting into the stadium: roaring singing. During the match: amazing. It didn’t stop, except for them cheering the goals and a break at half-time. Flags waved continuously. Drums were beating. The K stand must have been swinging twenty centimeters up and down under their rhythmic dancing. They kept singing, even when the home team and their fans (except me, a small black pebble in a sea of green and white) had long left the stadium. ‘Wir woll’t Rapid sehn!’ they roared and after an hour the victorious visiting team came out again, thanking their fans, showing them respect. The singing fans accepted their team’s respect gallantly, sang on for another hour or so and then we were released. Most of them then flew home immediately. I took a metro back into town, an experience richer I still cannot quite name right – weird, great, of a lifetime, surreal, all of the above? And all of this, really, only, because I sell beer to Austria and a guy called Markus. Darauf ein Bier!